RISTOMANAGER: MANAGE YOUR ACTIVITY; CATERING IN A FAST AND EFFECTIVE WAY. 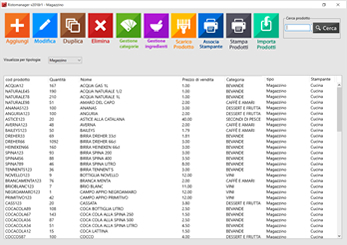 FROM THE MANAGEMENT OF PRODUCTS IN STOCK, UP TO THE ISSUE OF RECEIPT. Ristomanager is the only product on the market that does not need an internet connection, but works by using your PC as a Local server, thus exploiting the internal connection of your local network. This MAIN feature has been developed by our DECENTAL experience in the field of Catering, it has led us to find and TEST that some software solutions only work ONLINE is leading to halt the work cycle of the restaurateur, in the frequent cases in which the internet connection is absent, the software's work is completely blocked, they create serious DAMAGE TO THE RESTAURANT as the outstanding and the lack of evidence of the accounting situation of the TABLES. Product management of RISTOMANAGER was designed to make easier and at the same time accurate all the operations of loading and unloading from the magazine of the restaurant. For example, it allows to manage the stocks of the bar and restaurant. For each item, it is possible to set in the program, the amount that you have. 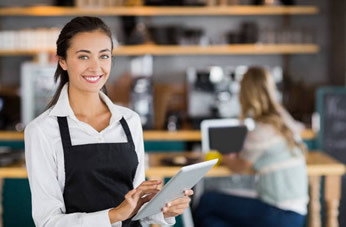 Via any tablet with an Android system, you can download the app RISTOMANAGER and maintain and manage orders in the course of your restaurant. 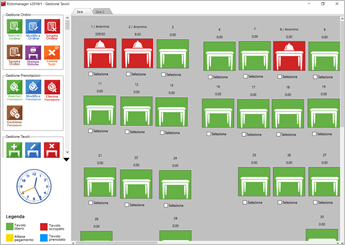 From the management of tables you can see the state of the tables in real time; handle free tables, occupied, reserved and wait for the payment. Through customer management you can enter the data of your regular customers, in order to easily insert them during reservations and while making orders through cashout. Customers can be entered directly from this window, or every time you make a reservation or order, first enter the customer and subsequently associate it with the operation you are performing. Through its simple interface, designed for touch screen and not, you can make the takeaway orders and send them to the relevant departments, also by emitting the receipt of the order. To help you select the products that the customer asks for, the products will be provided with a representative image associated during the loading of the product. 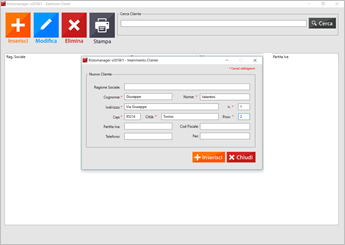 We remind you that Ristomanager, is not only a software to install on your PC, but you can also manage it from a remote device such as a tablet or an Android phone, simply by downloading the Android app and/or iOS app from the apple-store, you can manage tables, send the orders directly to the affected departments. 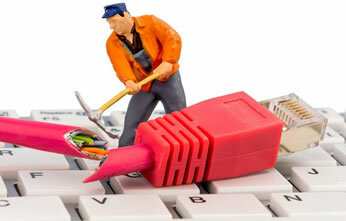 All the mobile devices can be used by the waiters while the software on the PC is started. 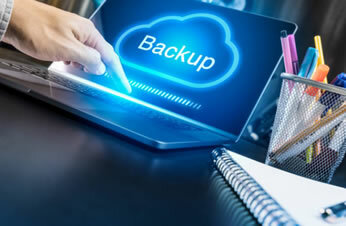 Ristomanager allows you to make backups simplified, so you can change the server pc in no time, just copy the folder Ristomanager, from one PC to another without having to reinstall strange services on your PC. This feature has been developed in the eventuality of your PC suddenly stopping during the evening, so you can simply copy the files and continue to work quietly. All sales data will be conveniently consulted in the statistical module. The color graphics make the consultation with statistics even more intuitive. 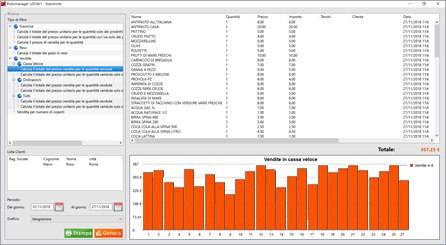 At any time you will be able to compare the statistical data with previous periods. 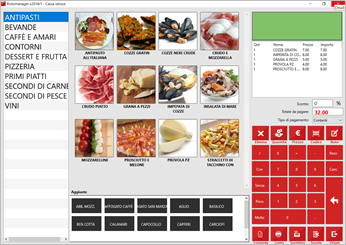 Thanks to all the filters in this window, you can analyse the development of your restaurant business and filter the results according to your requirements. Do you have doubts, or do you want to ask any questions about one of RISTOMANAGER functions?